This little book/speech is yet another proof: Neil Gaiman is wise and inspirational beyond belief. "Make Good Art" encourages its readers to chase their dreams, choose their paths, and to break the rules. 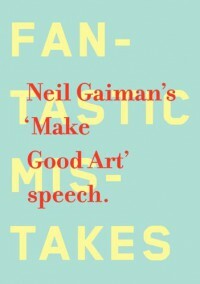 Gaiman implies that failures can be fantastic; that mistakes can be good, and that it all depends on finding your own voice and creating your own originality. To witness such an artistic man as Neil Gaiman share his views on good art is truly fascinating. Some people have complained about the layout of this book, but I really think it is brilliant. The illustrator actually proves Gaiman's point; that rules are allowed to be bend and broken. An important thing to remember and to cherish, always.